Girl Guides of Canada–Guides du Canada (GGC) members made significant contributions to Canada’s war efforts during the twentieth century. Our national archives collection offers a glimpse into how Girl Guides demonstrated bravery, ingenuity and selflessness during our nation’s most difficult times. This meant that there was little time and access to machinery to make badges, so they hand embroidered them. 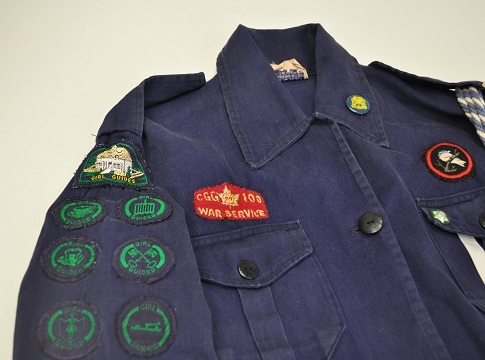 Photo description: A Girl Guide uniform from the 1940’s includes a hand embroidered War Service Badge over the right pocket. On the left collar is a tin enrollment button which replaced the normal metal enrollment pin due to scarcity of metal during wartime. 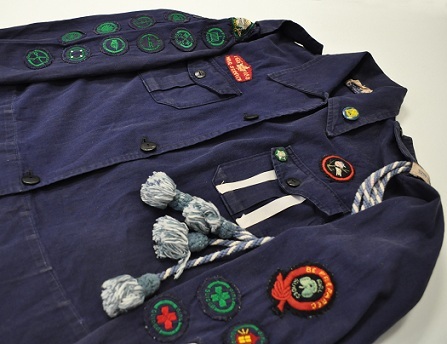 Photo description: A Girl Guide uniform from the 1940’s includes a hand-embroidered badge with the Girl Guide motto “Be Prepared” on the left sleeve. Did you know? 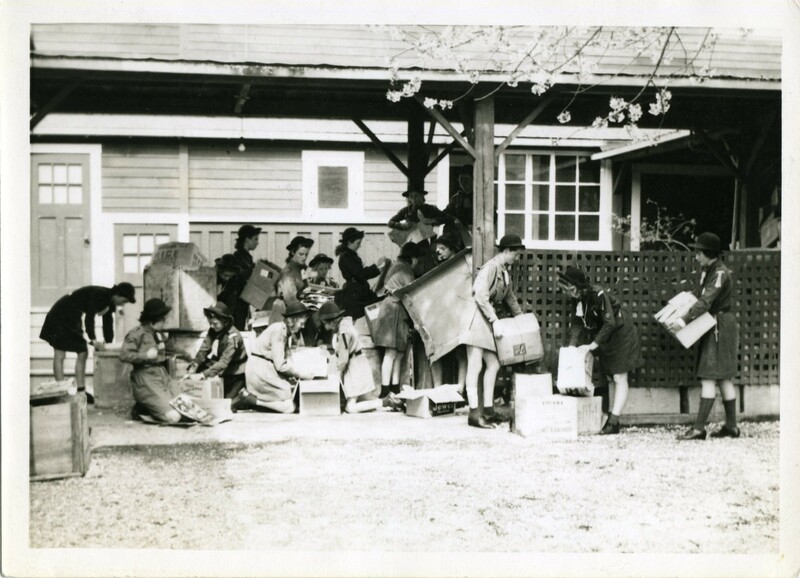 During the Second World War, Girl Guides organized and implemented a two-year National War Service Project called “The Guide Overseas Gift Project” beginning in November 1940. Through this project, Girl Guides knit and sewed over 29,665 articles of clothing, ranging from booties to overcoats and shipped them to England for distribution among the children who had been victims of bombings. Photo description: Queen Margaret’s School Guides, Duncan BC. Sorting and packing salvage to aid in the war effort , 1942. 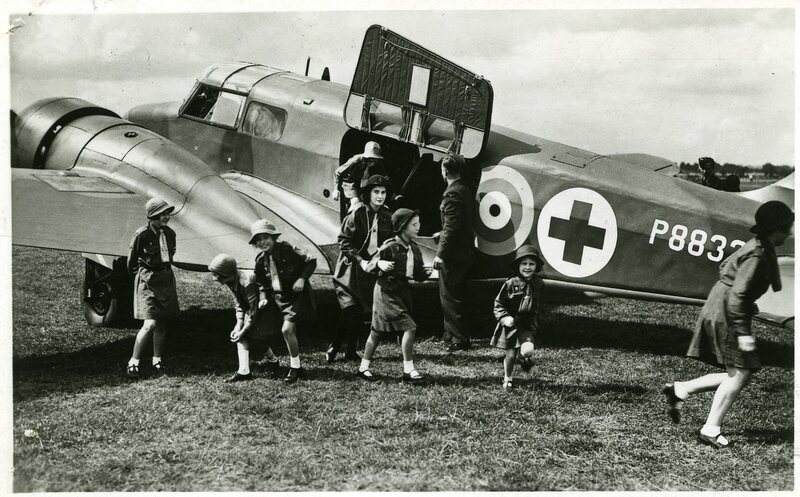 Photo description: In 1940, Guides from all parts of the British Empire contributed donations towards the purchase of two air ambulances and a motor lifeboat. This photo shows one of the air ambulances and with Guides and Brownies on the day of its presentation. Home Service – This included home nursing, first aid, household repairs, mending and thrifty cooking. Child Care – This included looking after children younger than 10 years of age. It also included learning to assist in the evacuation of small children and helping to make them comfortable and happy in temporary quarters. Transportation – This included knowing how to act as messengers in their own communities, drive a vehicle, repair motors, transport groups from a danger zone to a safe place and being able to orient themselves in strange surroundings with road maps, a compass, a watch and the position of the sun and stars. Land work – This included theoretical and practical knowledge of any form of food production with at least one month’s part-time work or three months’ full-time land work. The 10th Calgary Ranger Company went on alternate meeting nights to the local Military Hospital where they made over 29,650 dressings. The Coleman Alberta Guide Company adopted an English evacuee nursery of 38 children, 2 to 5 years old and sent parcels to them regularly. The Robin Patrol of the 1st Wawota, Saskatchewan Company made and sent a layette to Britain through the Overseas Gift Project, the mother who received the layette names her baby “Robin”. Toronto North Division made 20,000 tapes for plasma bottles for Red Cross clinics. The Rangers of sea Ranger Ship “Princess Royal” Toronto, staffed a shift in the Red Shield Service Canteen. They sewed Canada Badges, Regimental Insignia, G.S. Badges, etc., shortened, lengthened, taken in and let out uniforms for all Branches of the Services. They logged over 7,500 hours in War Service! We know that many units will mark Remembrance Day this year with unit activities (such as Valentines for Vets), by inviting local veterans to speak, and by participating in their local Remembrance Day services. Never forget. If you take photos of your unit’s Remembrance Day activities, we invite you to share them on our Facebook page! Gallery | This entry was posted in Awesome Activities, Opening the Vaults and tagged archives, female role models, history, Opening the Vaults, Remembrance Day, special days, war efforts. Bookmark the permalink. I was particularly impressed with today’s blog and how timely! It brought back a memory of my own activities as a Brownie in the latter stages of WW II. I can recall my friends and I setting up a concert in my back yard to raise funds for war relief and performing a war-time song duet with a Brownie friend. We charged a dime or whatever could be donated and raised close to $10.00 — with some parental input — which was considered a pricely sum in our eyes! Thank you for posting a special remembrance of what Girl Guide members contributed during the war years.